Call it the Game Of Thrones effect, or call it parallel thinking, or just call it a simple appreciation for fancy costumes and bitter hatred. Regardless of motivations, it’s been a big year for historical dramas about feuding British (and/or Scottish) royalty. First there was Chris Pine’s bloody Outlaw King, then the scandalous triangle of Emma Stone, Rachel Weisz, and Olivia Colman in The Favourite. 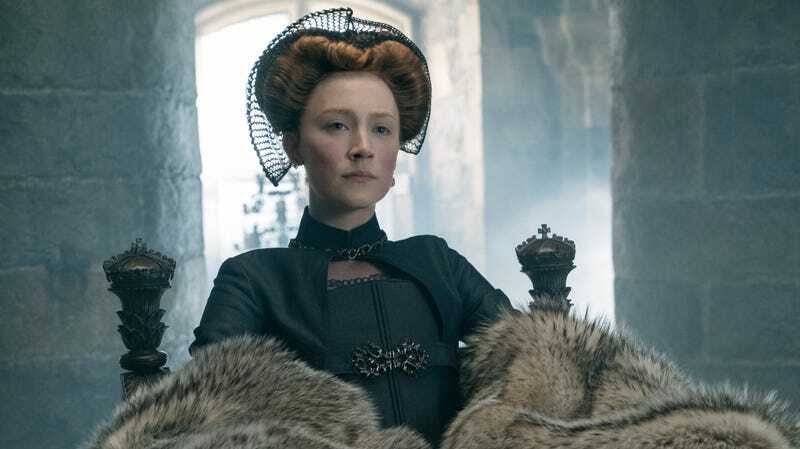 And now Margot Robbie and Saoirse Ronan star as rival queens in Mary Queen Of Scots, the feature-film debut of theatrical director Josie Rourke written by House Of Cards creator Beau Willimon. If you find your thirst for costumed intrigue sill unslaked— and you happen to live in Chicago—we’ve got good news: We’re giving away 50 admit-two passes to an advance screening of Mary Queen Of Scots on Thursday, December 6 at 7:00 p.m. at the AMC River East. To claim yours, simply follow this link and enter some basic information; but remember to arrive early, as advance screenings are always overbooked. There are a lot of contenders to this throne. Mary Queen Of Scots opens nationwide on December 7.